If you have ever tried to write a description of how part A works/fits onto/in/with part B, you will likely be appreciative of illustration. Bayer was born in Germany and was attached to the Bauhaus movement until the beginning of World War II, when he escaped and eventually settled in the United States. Through his friendship with Robert O. Anderson, he helped develop the corporate art collection for ARCO (wikipedia) that encompassed 30,000 works until it was liquidated upon ARCO’s sale to British Petroleum. Bayer was also involved in the complex planning of the Aspen Institute. 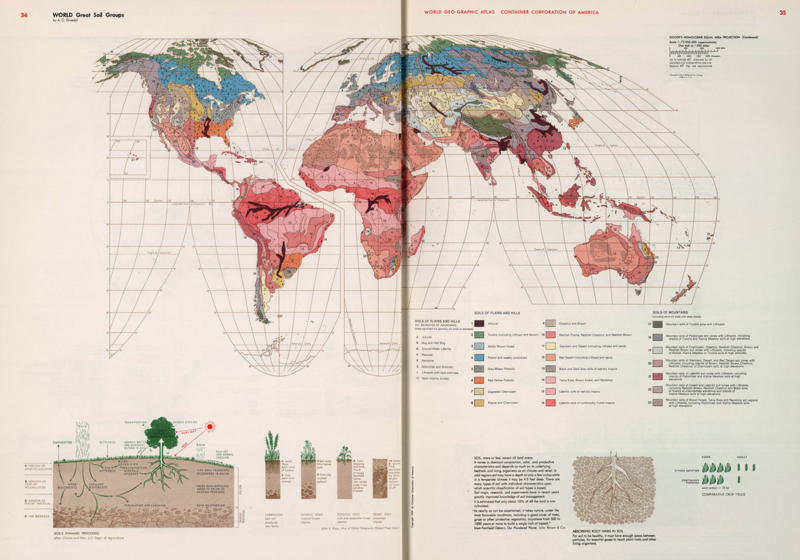 One of his great masterworks was The World Geo-Graphical Atlas which was funded by CCA (Container Corporation of America). Not content to build upon what was already available and just an update, Bayer immersed himself in study and travel. This work enabled him and his team of designers to envision and design a totally new approach to cartography that included “the color theories of of Egbert Jacobsen, the statistical representations of Otto Neurath and the dynamic design of Moholy-Nagy” (Codex99). Here is the page on soil types. It was totally Bauhaus in its ideal of complete design; the unity of art, craft, and technology. Soil types from the Atlas.